It’s lucky Day 13 in our 30 Days of Cozy series and today we have a lovely hat pattern designed by Fiona of ReVe Design Co. Designed to beautifully display the colors of the hand dyed merino/alpaca yarn used in the modelled photos, the Popcorn Cozy Beanie is a simple beanie with a feminine finish. Named because of the LOOK of the stitches, rather than the use of “popcorn stitch”, the beanie is constructed from the crown down, using clusters to create texture and effect. Shells form the final round, which forms a scalloped edging framing the face. Pair the beanie with the matching Popcorn Cozy Cowl (available on Ravelry) for a coordinated look. Purchase the ad-free, printable PDF of the Popcorn Cozy Beanie from ReVe Design Co. website or Ravelry. CSdc (counts as dc here and throughout) and 9 more dc into the Magic Circle. Repeat * to ** around, finishing with Ch 1. RND 3: Slst into next ch 1 space. Starting Cluster in ch 1 space. Repeat * to ** around, finishing with Ch 2. RND 4: Slst into next ch 2 space. Starting Cluster in ch 2 space. Cluster in same ch 2 space. Slst into next ch 1 pace. Cluster in same ch 1 space. Repeat ^ to ^^ 3 more times. RND 6: Slst into next ch 1 space. RND 11: Sc into next ch 1 space. * Shell (5 dc) in next ch 1 space. Repeat * to ** around. Join to 1st sc with a slst. I know you’re going to love making the Popcorn Cozy Beanie and I so look forward to seeing your finished product. With 50 published designs to her name, most within the last 18 months, Fiona Langtry from ReVe Design Co has a distinctive boho-chic style and a love of ‘special’ stitches which causes experienced crocheters to make statements like “I have crocheted for more than 40 years and absolutely love that you are teaching me new stitches” (Mary, a pattern tester, Aug 2018). Designs such as the “Nordic Cape”, the “Relaxed Boho Vest” and the ‘Wear a Blanket Poncho’ have all been featured in the top 5 of “Hookin’ on Hump Day” during the past 2 years. 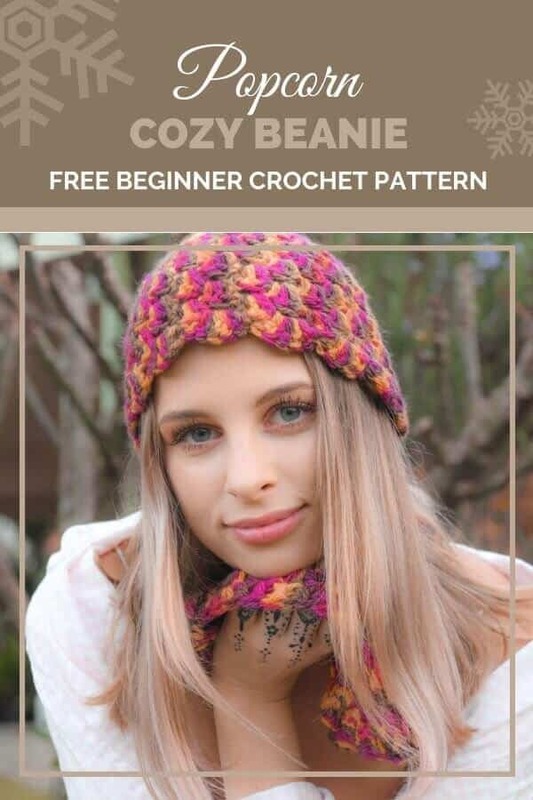 Most of her patterns are intermediate level, but a lot have basic or beginner-level options, and/or photo instructions which help crocheters improve their skills.